At its most basic, being "equipped to survive" means recognizing that what you have on your person may be all that you have available to assist you in coping with an emergency. No matter if your survival circumstance occurs in a city or in the wilderness, no matter how much equipment you may have in a survival kit stored at home, in the car, at work, in the plane or in the boat, it could easily come down to what you are personally carrying. You may be eternally grateful to have survived with just that much. You should always carry a minimal amount of equipment and supplies on your person, whether stuffed into pockets or into a small container(s) which fit(s) into your pocket(s) or on your belt, but from which you are unlikely to become separated. Storage in a purse, fanny pack (often a misnomer as many are designed to be worn in front), or waist/belt pack are other possibilities, though not quite as secure since they may not be worn continually. From my perspective, cargo pants and shorts (an adaptation of military BDU design) are about the greatest thing to come along since sliced bread. Plenty of pockets for all your gear. What you carry may depend upon where you will be traveling and what you will be doing. Some equipment is universal, a knife for instance. Other equipment is more specific. You might well not carry a signal mirror in the city, but it would be a very good idea in the wilderness or when flying or boating. Survival preparation is always about risk management. Everyone's assessment of any particular risk varies, as does their preparations. It's almost always location specific to one degree or another. As I write this, I live in a very urban environment in an area where any unexpected catastrophic natural disaster such as tornado or earthquake is extremely unlikely. As such I don't normally carry items like firestarters or water purification on my person on a daily basis. I am quite confident that I'm well equipped to survive anything that I am likely to encounter in the areas I operate in. My kit varies by what I am doing and where I am doing it. Once I am leaving the urban area, it increases substantially. The idea is to carry the most basic items that cannot be easily improvised or are not likely immediately available in an emergency. These are tools and supplies that allow you to deal with the most likely emergency scenarios. Nobody can be prepared for everything. The majority of gear I carry everyday is stuff I use regularly, but which will also serve me well in an emergency. The key chain illustrated is a Bison Designs Circle Key Caddie. This key caddy allows me to quickly detach items from the keychain when needed and to add items when I need to carry more gear. The clip can be used to ensure it all stays with me in adverse circumstances. While cell phones often prove useless in emergencies involving significant numbers of people or a large area of devastation due to the service being swamped (as has occurred in terror attacks and natural disasters), often text messaging works fine as it uses far less bandwidth. TIP:I was asked why I carry both a handkerchief and a bandanna. For everyday use, the handkerchief is used to blow my nose, wipe dribble from my beard and otherwise attempt to maintain a more or less civilized appearance. The bandanna is heavier duty and larger for sweat. When it's 115 F in the shade, you tend to sweat a lot. Sometimes I cary two bandannas. From the perspective of being prepared, most handkerchief are too thin and too small to tie over your mouth to act as a improvised dust/smoke filter, or as a sweat band, etc. (you can hold them over your mouth, but that ties up one hand that you may otherwise need). With both, you can also leave the hankie folded and hold it in place over your mouth with the bandanna, for even more dust/smoke filtering (wetting these also helps a great deal). This isn't as effective as a smoke mask or hood, but it will do when nothing else is available. It also doesn't hurt to have something bright to use as a signal of sorts, and since I generally don't dress in bright colors in town because I'm normally trying to remain inconspicuous, it could serve for that purpose as well. Obviously, lots of other uses for a bandanna in the wilds. TIP:I was asked why I include a Photon Micro-Light in my Mini Personal Survival Kit when I already carry a Doug Ritter Special Edition Photon Freedom Micro-Light in my pocket. Battery operated devices have a habit of conking out when you need them the most. While I try to be religious about exchanging batteries when I feel they've been used long enough, not waiting until the light goes dim, you just never know how much life remains after a period of time in something like the Photon that you use regularly. The choice is a spare battery or a complete unit. Whether in your kit or kept elsewhere on your person, a second light allows you to just use it, no muss, no fuss. My vehicles are well equipped with considerable additional supplies including a substantial amount of water. My Mini Personal Survival Kit in a small tin (shown) or supplemented Adventiure Medical Kits Pocket Survival Pak. You should also always carry any personal medications that you cannot live without (at least a couple days' supply, perhaps more depending upon where you are traveling). A spare pair of glasses, if appropriate, is not a bad idea as well. The first aid supplies I carry have never expired, they end up being used on a regular basis; most often by others rather than myself. With a reputation for being "equipped," friends naturally turn to me when something happens. Typical was an aviation event where a good friend managed to pinch his hand rather badly. Blood dripping from the wound, he passed by two cops and a first aid tent as he made his way to where he knew I was, where he knew I'd have something to deal with it. I suppose I could have worse reputations. You do have to remember to replenish whatever you use, otherwise it won't be there when you really need it. I use shrink tubing to protect both the firestarter and sharpener. The back-up Sparky magnesium and flint firestarter normally comes in a little nylon pouch with a scraper/striker. The knives I carry work perfectly well for scraping and striking and the tubing protects it in my pocket with a lot less bulk. Just slit the tubing with a knife and it's ready for duty. With the sharpener the tubing served to keep the diamond dust pad from becoming worn and contaminated, which is what happened originally. It also quiets the rattling in my pockets by a little bit at least. My Mini Personal Survival Kit is based in concept on those first developed for use by the British SAS. They have long used a tobacco tin as a convenient sized, more or less waterproof case for such a kit. A number of companies market commercial survival kits based on this concept, as well as using other containers. 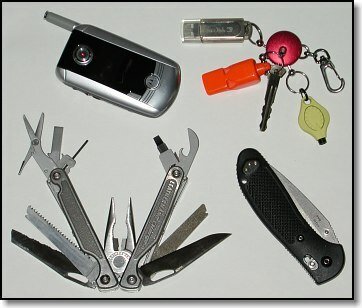 Equipped To Survive's reviews of Personal/Pocket Size Survival Kits covers many of these. You can find these tins in a variety of sizes at your local tobacco shop, just toss the contents (the smell takes quite a while to go away). The tins are also shiny enough to use as a signal mirror. They can be made even better if you strip the outside with paint stripper and take some metal polish to it, then lacquer or clear coat it to prevent rust. If you don't coat it, the polished metal will rust -- been there, done that, learned my lesson. There are other choices for packaging, some of these are waterproof, some not. Those I've seen used or tried myself include: Band-Aid boxes, candy tins (Altoids being the most common), fly (fishing) boxes (my large personal kit is based on a Richard Wheatley Ltd aluminum fly box), Otter boxes, small nylon cloth pouches, plastic pill bottles, 35mm film canisters and PVC pipe. No doubt there are other possibilities as well. If you've used some other container successfully, or seen others used, please let us know so we can share these ideas with everyone. Putting one of these small kits together yourself can be a lot of fun and a challenge. It takes patience and ingenuity to pack these small kits with as much as possible. You can review ETS Editor Doug Ritter's personal mini survival kit to get an idea of what might be included and how tightly you can pack stuff in. The secret is not to be afraid to start all over again when it all doesn't quite fit. Sometimes it just won't, but often it just takes another approach to how you pack it in. One thing some people lose track of is that when you have a tightly packed kit with all this cool gear, it isn't going back together once you open it in the field. A certain percentage of what's inside will need to be able to be stored in your pockets once the kit is opened. Some include a small plastic or cloth bag for holding this stuff afterwards. While typically you would only carry a single such kit, another option to carrying a single larger kit is to put together two small ones. You could, perhaps, split it between medical and survival equipment and supplies. Since the medical tends to get short shift in the smaller kits, this allows you to carry more medical supplies without sacrificing the survival equipment. Besides the kit itself and your knife, etc., another handy item to have along is a garbage bag or two. A folded garbage bag takes up very little space and two will easily fit in a pocket. These can serve multiple purposes, but are most likely to be used as emergency shelter. An alternative is one of the lightweight "Storm Shelters - Instant Pocket Tent" which are distributed by the Tacoma Mountain Rescue Unit. This is a 80 x 96 inch bright yellow plastic tube that can be configured in numerous ways for individual shelter. It comes in a zipper lock plastic bag with printed survival instructions and a book of matches. I ditch the rest and vacuum pack the Storm Shelter, which then fits easily into even a small pocket. Another alternative is to carry a Space Emergency Blanket, but they have their own drawbacks The latest Adventure Medical Kits polyethelene Heatsheets emergency blanket addreses almost all the concerns and it makes a decent emergency shelter to carry. Some pilots prefer to carry even more equipment in a waist pouch or survival vest. Survival vests are available in many configurations. Many are adaptations of fishing or photographer's vests and some pilots just use these style vests in lieu of the real thing. Some work better than others. If at all possible, try it on beforehand, in the plane you'll be flying. A military vest, constructed with Nomex, is probably one of the best choices (less expensive nylon versions of the military vest are also available and should be avoided). A Cotton (not nylon)short fiy fisherman's vest can also be used. For comfort, safety and ease of egress the vest should not be too long, stopping at or above the waist, and not too loose fitting, to prevent it from catching on something on your way out. For those selecting a fishing vest, the shorty models tend to be better in the aircraft, for the reasons mentioned. One survival vest worth a special mention is offered by Eagle Enterprises and was originally developed for the U.S. Fish and Wildlife Dept. Their vest is based on the Stearns "Deluxe Inflatable Angler's Vest" which can be found at many fishing stores. The vest is modified with the addition of a handy pocket for a 2-AAA penlight (a bit too tight on the sample I examined) and incorporates international orange Nomex IIIA material instead of the normal poly/cotton or nylon material. The zippers and Velcro are not changed, so they are a weak link in the fire resistant modifications. On balance, though, it is a good idea. The Nomex provides a degree of protection for the vest's survival equipment and the internal inflatable bladder, as well as for the pilot. This CO2 inflatable bladder gives 18 lbs. of buoyancy in case of a ditching. While not acceptable, in my opinion, as a vest for true over water use, it would be a most welcome aid, quite possibly a life saver, for a pilot putting down in a river or lake close to shore or rescue. It is a reasonable compromise for pilots who fly over remote and hostile terrain with a lot of rivers and lakes or who fly float equipped aircraft into the bush. Eagle also offers the vest equipped with vacuum packed survival equipment and supplies, most all of it high quality. However, you would do well to carefully examine their specific list of contents vis-a-vis the information on this Web site and adjust the contents somewhat as may be appropriate. They will generally be happy to accommodate your requests. I also found that they packed too much in the rear pocket for my comfort, forcing me too far forward in the seat, an uncomfortable and potentially unsafe position. © 1994 - 2003 Douglas S. Ritter & Equipped To Survive Foundation, Inc.